Brass disc approximately 3.3cm in diameter. Punched hole for hanging. 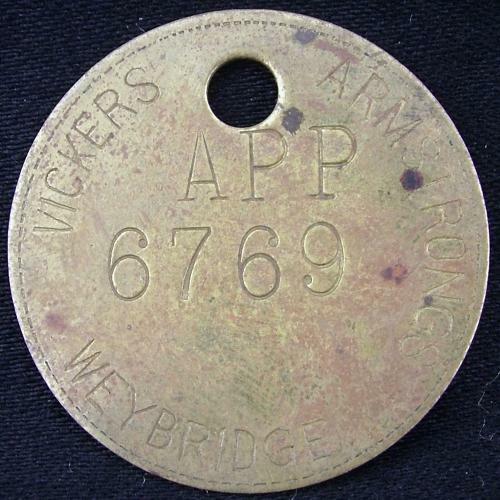 Engraved 'VICKERS ARMSTRONG WEYBRIDGE' around the edge and 'APP 6769' to the centre. During WW2, the Vickers Armstrong's Weybridge site was used for aircraft production, notably the Wellington, Warwick and Hawker Hurricane. Despite the extensive camouflaging and use of trees, the Vickers factory was successfully bombed by the Luftwaffe and extensively damaged on 4 September 1940 with nearly 90 workers killed and at least 419 injured. This tag is probably a factory worker's token or tally, given out when the worker arrived and handed in on completion of the shift. Thus the number of workers on site would be known in the event of any incidents. The stamping is legible but not deep. A scarce item. Stock code M23276.